Thirteen hours only from the Earth to Mars, and here was a growl at the length of the voyage! I was very excited when they dropped their first book, and even moreso when I found out it was a little-known novel from the late 19th century about space travel -- and with an introduction by Jules Verne, no less! 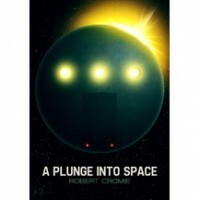 Well, in as many ways as Robert Cromie's A Plunge Into Space lived up to my hopes, it also lived up to demonstrating why it's largely forgotten. It is very much a mixed bag. A Plunge Into Space has moments that are genuinely wondrous. It also has sections that are clumsy in a way that's funny and endearing, like an old b-movie or stories that you once didn't know were amateurish because you were a child. But there are stretches that feel actually, sometimes interminably, bad, and sometimes offensive. Like, even-after-taking-into-account-that-it's-from-the-19th-century offensive. When this book is at it's most enjoyable, it is also batshit crazy, and kinda charmingly incompetent.